Whether you are a producer of food, non-food or pharmaceutical products, it is important to choose the right metal detection solution for your product inspection needs. Once you have made the decision to invest in a metal detection solution, there are a number of things to consider such as product characteristics and where the solution will need to be installed. Our Metal Detection Portfolio Infographic provides a step-by-step guide on finding the most suitable solution to your application. What products are you inspecting? The type of product you will be inspecting will determine the most suitable solution. For example, if you are inspecting dry packaged food, a Profile metal detector will be the best option. However, food that is wet, chilled, frozen, hot or in metalized film packaging will benefit from a Profile Advantage, delivering far greater detection capabilities in challenging applications. METTLER TOLEDO offers metal detection solutions for almost any possible application, for example dry powders, snack foods, liquids and pharmaceutical tablets have specific solutions to maximize detection capabilities. Our range of pipeline systems are tailored to address specific requirements, from integration with vacuum fillers for pumped sausage meat through to overcoming bubbles and voids in the product flow of pumped liquids, pastes and slurries. Will the metal detector be part of an integrated system? If opting for a Tunnel metal detector, purchasing this as an integrated conveyorized solution ensures equipment performance is maximized and false rejects are reduced, without compromising on sensitivity. If opting for a Vertical metal detector, how will this be integrated with the rest of your production line? 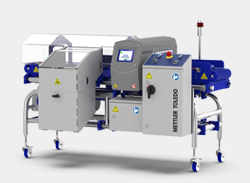 METTLER TOLEDO's Throat metal detectors for example are designed specifically for use with Vertical Form Fill and Seal bagging machines. How will your products be rejected? There are a number of reject devices available when using an integrated metal detection system from METTLER TOLEDO. Options for conveyorized systems range from simple stop-on-detection mechanisms to more sophisticated detect-and-reject systems such as air blasts and pushers. For gravity-fed applications, the type of product will determine which solution you opt for, for example a Sealtite Gravity Fall system will be most suitable for high value powders and dusty products. 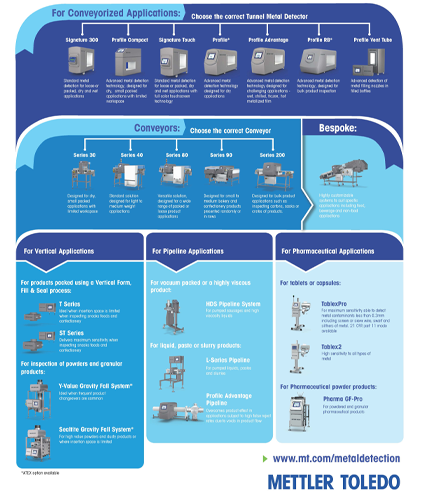 This simple Metal Detection Portfolio Infographic provides a useful overview of our metal detection systems and takes you through the process of how to choose the most suitable solution suited to your application.